At Beacon Hill in Boston, Massachusetts legislators in the final hours of the legislative session July 31, 2016, passed S1984, a landmark bill to protect elderly and disabled victims of harassing and bullying. The law would establish the nation’s first state legislative study commission on bullying, shining light on the widespread plague of bullying impacting residents of multifamily public and subsidized housing. When signed by Governor Baker, the commission will enable all stakeholders to work together to begin finding effective remedies. By working together, patiently and persistently, and by forming alliances and partnerships in the community, with victims, advocates, and with our legislators, our coalition has achieved a great step forward. Thank you for what you have done, and for what we will do together to eliminate bullying.. Legislators heard the emotional and painful stories of victims of bullying, including that of an Attleboro resident of multifamily housing. “Margaret” is a person living with disability who spoke out for the rights of the several other disabled persons who were the victims of bullying. For her troubles, she was mobbed and unfairly evicted, and made homeless for over a year and a half. Many others testified to the seriousness of the problem before hearings of the Joint Committee on Housing. At least 20% of independent living elderly residents of multifamily housing are bullied. A bill sponsored by Joan B. Lovely, Bradford R. Hill, Leah Cole, William N. Brownsberger, and other members of the General Court including Barbara L’Italien, Bruce E. Tarr, Richard J. Ross, James M. Murphy, and Jason M. Lewis was amended and sponsored by the Joint Committee on Housing as S1984. They were joined by their colleagues including the leadership of House and Senate in the General Court, spearheaded by the combined North Shore delegation, all pushed to create a commission to bring together all the stakeholders in housing to better understand the causes, and find solutions to, bullying and harassing. The 19-member commission will include leaders of the House and Senate, executives of several state agencies, and members appointed by the Governor to represent the interests of managers and residents. The Commission is to hold hearings to gather testimony from all interested parties, and make a report by the end of 2017. Despite the legislative logjam, the bullying commission received expeditious treatment under the leadership of Senate President Stanley Rosenberg; Speaker of the House, Robert DeLeo; and key committee chairs including Representative Ted Speliotis, Chair of the House Committee on Bills in the Third Reading, Representative Brian S. Dempsey, Chair of the House Committee on Ways and Means; and the Co-Chairs of the Joint Committee on Housing, Senator Linda Dorcena Forry and Representative Kevin G. Honan as well as past chair, Senator James Eldridge. Other proposals by Representatives Paul Heroux, who supported S1984, and Diane DiZoglio, can be addressed by the commission. Jerry Halberstadt, the Coordinator of the Stop Bullying Coalition (SBC), has lived in privately-owned, HUD-subsidized housing where he confronted bullying and mobbing. For three years he was one of founders and leaders of the tenants’ association. He is a writer, photographer, and publisher, has an MA in Anthropology and has consulted on issues of empowering and including minorities in the US and Israel. His forthcoming book is Stop Bullying: Creating Healthy Communities for the Elderly and Disabled, (Peabody: Togethering Press, Forthcoming 2017). PEABODY — A Peabody man’s experience paved the way for a measure establishing a study commission on bullying in public housing that was passed by lawmakers Sunday. 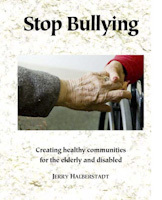 Five years ago, Jerry Halberstadt, 80, launched the Stop Bullying Coalition to help stem the tide of abuse against elderly and disabled public housing residents. PEABODY — Two years ago, a Peabody resident drafted a bill designed to protect seniors from systemic bullying in subsidized housing. The Legislature has passed a bill creating a commission to study the issue of bullying in public housing complexes, an issue raised by Attleboro residents over the years. State Rep. Paul Heroux, D-Attleboro, said he has been pushing for action for 2 1/2 years after hearing from residents. BOSTON (AP) — A bill passed in the closing hours of the legislative session on Beacon Hill seeks an end to what many tenants say is a pattern of bullying and harassment in public and subsidized multi-family housing. It has been a long and challenging process but you persevered! We are one of the first states to recognize that bullying is a serious issue in senior and disabled housing and are taking some legislative steps to address this issue. Thank you to you and your committee for all your hard work! Training needs to be given to private landlords who have subsidized units housing the elderly to ensure they know, legally, what measures to take when the elderly are bullied by neighbors or neighbors ignore complaints made to landlords by those elderly residents. "What's the big surprise" - there's bullying by seniors? I was bullied in kindergarten, and the same five girls bullied me through the 5th grade, when I finally skipped fifth and went into sixth, leaving that class and those girls behind. I later taught Kindergarten and other grades. I spotted the bully girls, but didn't know what to do. A boy told me other boys were lying in wait for him after school and beating him up. As his teacher, I told the school principal, and he said anything that happened off the school premises was not the school's affair. And of course, there are bully principals, bully custodians, bully teachers. My sister was also a teacher. She was targeted by five "witch women," as she called the parents of some of her 4th grade students. The witch women were pals of the superintentent of that small rural school district. When the witch women's daughters went on to junior high, they targeted the junior high teacher, and my sister was finally rid of them. As for me, after junior high school, I was fine till I started working in offices. The atmosphere in most of them was oppressive, and much of what Jerry describes about bullying went on there. So I went into business for myself and was fine till I moved to an apartment. Two of them had bullies, and now I live in one where I'm left in peace, but the manager is a witch woman. Nobody on staff lasts -- but she stays and stays and stays. Since there are "no cause eviction" laws in my state, I'm terrified of her. I stay out of her way as much as possible. I personally think the "same" people who bullied in school, in their families, and in the workplace are the ones who are still sharpening their daggers in senior housing. And by this age, their cruelty skills are so highly polished that no well meaning person can fight back against this type of psychological warfare. So, what's the big surprise -- that seniors are not all sweet little old ladies and wise, gentle, men?